Out of this Prana is evolved everything that we call energy, everything that we call force. It is the Prana that is manifesting as motion; it is the Prana that is manifesting as gravitation, as magnetism. It is the Prana that is manifesting as the actions of the body, as the nerve currents, as thought force. From thought down to the lowest force, everything is but the manifestation of Prana. The sum total of all forces in the universe, mental or physical, when resolved back to their original state, is called Prana. This opens to us the door to almost unlimited power. Suppose, for instance, a man understood the Prana perfectly, and could control it, what power on earth would not be his? …. He who has grasped the Prana has grasped all the forces of the universe, mental or physical. He who has controlled the Prana has controlled his own mind, and all the minds that exist. He who has controlled the Prana has controlled his body, and all the bodies that exist, because the Prana is the generalized manifestation of force. 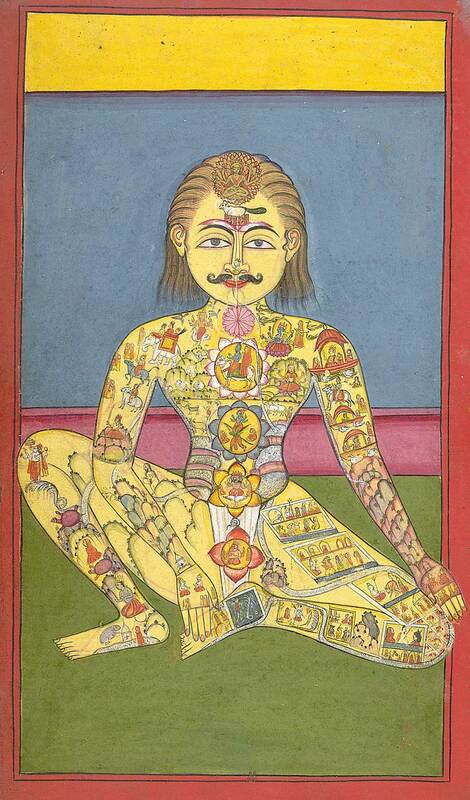 Sapta Chakra, from a Yoga manuscript in Braj Bhasa language, 1899. This shows the seven (or "sapta") chakras and images for visualization on the nadis or energy channels in the body. How to control the Prana is the one idea of Pranayama (extension of the life force). All the trainings and exercises in this regard are for that one end. Each man must begin where he stands, must learn how to control the things that are nearest to him. This body is very near to us, nearer than anything in the external universe, and this mind is the nearest of all. The Prana which is working this mind and body is the nearest to us of all the Prana in this universe. This little wave of the Prana which represents our own energies, mental and physical, is the nearest to us of all the waves of the infinite ocean of Prana. If we can succeed in controlling that little wave, then alone we can hope to control the whole of Prana. The Yogi who has done this gains perfection; no longer is he under any power. He becomes almost almighty, almost all-knowing. We see sects in every country who have attempted this control of Prana. Modern physics also has demonstrated that the sum total of the energies in the universe is the same throughout. It has also been proved that this sum total of energy exists in two forms. It becomes potential, toned down, and calmed, and next it comes out manifested as all these various forces; again it goes back to the quiet state, and again it manifests. Thus it goes on evolving and involving through eternity. The control of this Prana, as before stated, is what is called Pranayama. Within the Hindu Yoga tradition, a nadi is a subtle energy channel. 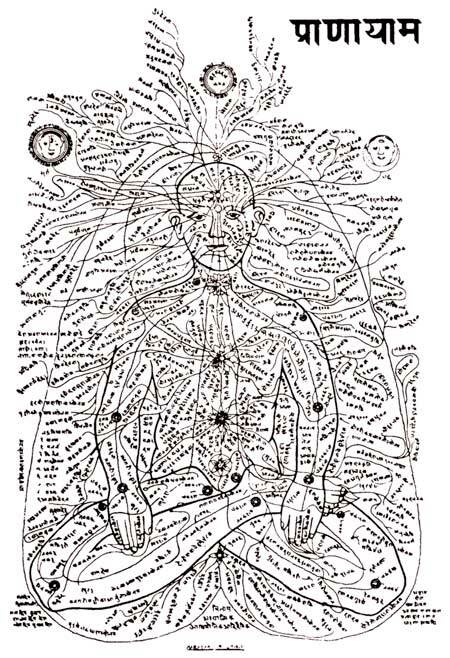 Conceptually it is similar to the Chinese jing luo, or meridians. Perhaps some of you have read that in Pranayama, when drawing in the breath, you must fill your whole body with Prana. In the English translations Prana is given as breath, and you are inclined to ask how that is to be done. The fault is with the translator. Every part of the body can be filled with Prana, this vital force, and when you are able to do that, you can control the whole body. All the sickness and misery felt in the body will be perfectly controlled; not only so, you will be able to control another's body. Everything is infectious in this world, good or bad. If your body be in a certain state of tension, it will have a tendency to produce the same tension in others. If you are strong and healthy, those that live near you will also have the tendency to become strong and healthy, but if you are sick and weak, those around you will have the tendency to become the same. In the case of one man trying to heal another, the first idea is simply transferring his own health to the other. This is the primitive sort of healing. Consciously or unconsciously, health can be transmitted. A very strong man, living with a weak man, will make him a little stronger, whether he knows it or not. When consciously done, it becomes quicker and better in its action. Next come those cases in which a man may not be very healthy himself, yet we know that he can bring health to another. The first man, in such a case, has a little more control over the Prana, and can rouse, for the time being, his Prana, as it were, to a certain state of vibration, and transmit it to another person. Cases of healing from a distance are perfectly true. The Prana can be transmitted to a very great distance; but to one genuine case, there are hundreds of frauds. This process of healing is not so easy as it is thought to be. In the most ordinary cases of such healing you will find that the healers simply take advantage of the naturally healthy state of the human body. An allopath comes and treats cholera patients, and gives them his medicines. The homoeopath comes and gives his medicines, and cures perhaps more than the allopath does, because the homoeopath does not disturb his patients, but allows nature to deal with them. The Faith-healer cures more still, because he brings the strength of his mind to bear, and rouses, through faith, the dormant Prana of the patient…. Sometimes in your own body the supply of Prana gravitates more or less to one part; the balance is disturbed, and when the balance of Prana is disturbed, what we call disease is produced. To take away the superfluous Prana, or to supply the Prana that is wanting, will be curing the disease. That again is Pranayama — to learn when there is more or less Prana in one part of the body than there should be. The feelings will become so subtle that the mind will feel that there is less Prana in the toe or the finger than there should be, and will possess the power to supply it. These are among the various functions of Pranayama. They have to be learned slowly and gradually, and as you see, the whole scope of Raja-Yoga is really to teach the control and direction in different planes of the Prana. When a man has concentrated his energies, he masters the Prana that is in his body. When a man is meditating, he is also concentrating the Prana. Editor's Comments: This entry was taken from The Complete Works of Swami Vivekananda/Volume 1/Raja-Yoga/Prana. The Indian concept of Prana in many ways resembles the Chinese concept of Qi. Wikipedia partially defines both as "life force." http://en.wikipedia.org/wiki/Prana ; http://en.wikipedia.org/wiki/Qi However qi is not exactly prana, nor is prana exactly qi because each term carries, and is embedded within, the belief systems of their respective cultures. To perhaps overly generalize: traditional Chinese thought is rather scientific-philosophical, whereas Hinduism is a complete religion with an extensive pantheon of gods and goddesses. Nevertheless each are pinnacles in the history of mankind.